Blue Cotton and Recycled Denim Poncho from Guatemala, "Twilight Illusion"
Threads of indigo and light cadet blue create a lovely tone in this poncho from Guatemala. Designed by Luisa Villavicencio, the poncho is loosely woven on a backstrap loom from cotton and recycled denim. Long tassels and a V-neckline add attractive details to the design. 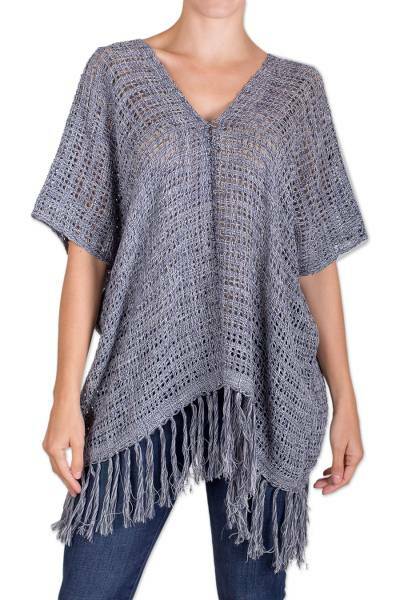 You can find cotton and recycled denim poncho 'Twilight Illusion' by Luisa Villavicencio in clothing categories such as Hand Woven Ponchos, Eco-Friendly Ponchos and Cotton Ponchos. Enjoy exploring these sections for other Novica treasures.